Superman and Wonder Woman explain their plan to Parasite. He tracks down the power source, they allow him to feed on it and in exchange he has his freedom. initially dubious, Parasite agrees if he gets a five second boost of energy from Diana, and despite their aggression, Clark & Diana allow it. Parasite then taps into the Earth's magnetic field and is overcome with a lust to feast, and like a bloodhound he leads the heroes to their goal, 800 miles away in Kentucky. Elsewhere, Vandal Savage lectures the former White House employee, his son Angelo, on the importance of his plan. Vandal tells him that he must follow the plan and eventually his desires will also be met. Angelo shuts down the transmission and takes an elevator to an underground lair. Inside, Firestorm trapped, seemingly powering the base and all the supervillain escapees from the Steel's prison all in a catatonic state. With Parasite taking the lead, he shows Clark & Diana he is able to absorb even the black hole generating perimeter guards with minimal effort. Leading them all down a hidden manhole, the trio head into the base only to be confronted by the same aforementioned sight of Firestorm and the villains. Angelo appears on a video screen, and they realize that he was the Chief of staff at the White House (his parentage is not mentioned to them). Angelo tells them he has all the villains under his control and now that they have invaded his inner sanctum he will indoctrinate and drain them too. 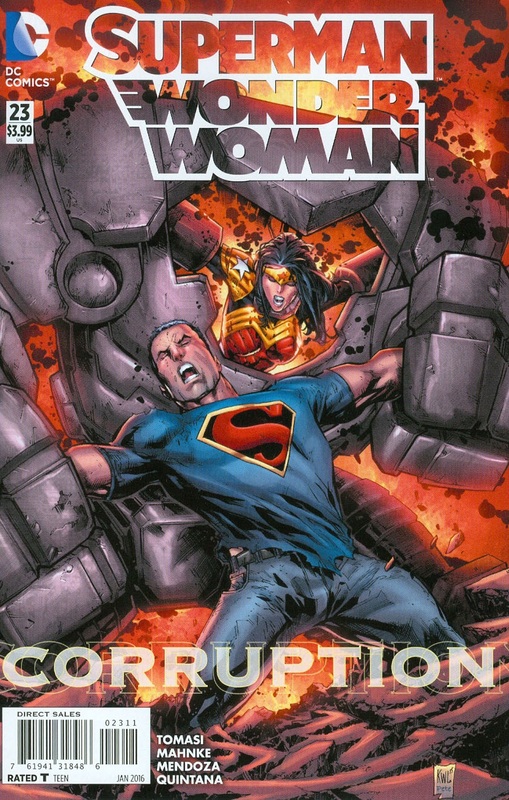 A vicious fight begins with the Parasite, Superman and Diana, fighting side by side. Parasite taking out the guards, Superman, the Atomic Skull and Wonder Woman, Livewire and the rest. Just as the tide is turning Superman notices a pool beginning to gurgle and suddenly a strange armor rises and absorbs Wonder Woman. Superman looks on in horror as his former lover switches sides and aims to kill him! Story - 3: Not much in the way of story here. Lots of Parasite, lots of fun dialogue for him, but not much in the way of story development for Clark or Diana. For those that didn't like their violent attitude to the villain last issue, I'd suggest skipping to the last page because they don't dial down the aggression. Aside from the Vandal Savage/Angelo scene, to be honest not much happens at all to advance the story and that's disappointing having had to wait a month for what amounts to a few pages of punch, kick, drain, rinse and repeat. The only positive I can see in character is that Clark & Diana show that they can still be professional and fight side by side despite their relationship ending, but I'm tenuously suggesting that, trying to see at least something there, that maybe isn't? You be the judge. If you didn't think Clark was being 'Superman-like' and Wonder Woman 'God of War like' before, this issue won't change your mind. In solicitations the blurb said Lois Lane and Lana Lang were going to cast aside their differences and join forces working together as a team to help Clark... this didn't happen and I'm thoroughly disappointed this was not part of the book because I was looking forward to Lois and Lana being a positive force. Lois needs some positive writing in 'Truth' because with Jimmy dead, Lana and Lois are his only 'family' left. I'm a bit sick of Lois being written as a villain, truth be told I am growing to hate this storyline more than the now legendary 'Grounded' storyline. If ever there is a literary class that needed to examine comic book violence, they have plenty here and not much else. Art - 5: The art is strong, the layouts beautiful, I only wish that Mahnke was given a bit more to do that an episode of Batman '66. The fight scenes look great but with there literally being no character beats in the script, there is no break from the 'kick this, punch that' vibe this issue. I'm not looking for soap opera drama, just some breaks in the action to give me Clark Kent and Diana Prince. Cover Art - 3: The cover is loud, brash and does something I frown upon. It reveals the ending. That is not cool. Not only that but it doesn't sell it very well either. I feel it looks rushed and when I saw it was by Ed Benes and Pete Pantazis I was doubly disappointed as it just was not up to their usually brilliant standard. Looney Tunes Variant Cover Art - 5: These variants are a joy. There isn't one across the DC line I dislike and this one is just a bundle of fun. It actually made me want to read the story it depicted! 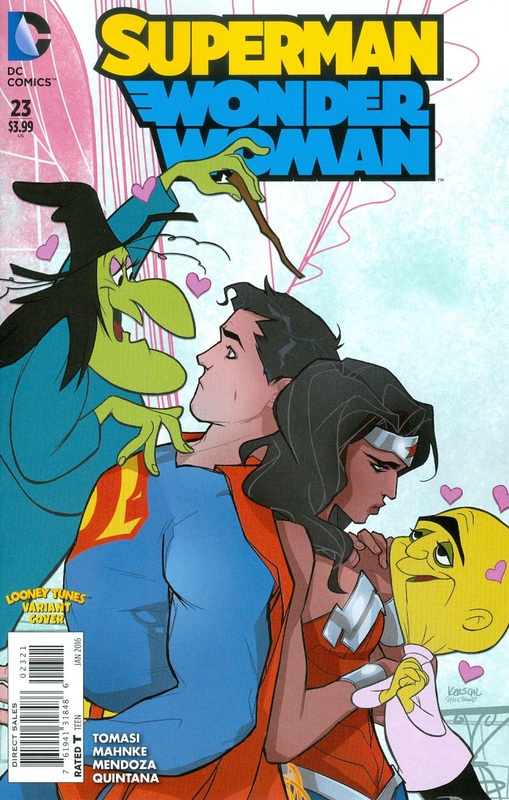 I miss when Superman and Wonder Woman were fun, in a world where they are now just grim and gritty, things like this that remind us of their lighter side and it makes me smile.